so, i made these as an appetizer for a dinner we hosted for friends, and they were delicious. it’s a great way to get someone to eat quinoa. the first time i made quinoa, ryan said “le, what IS this?” i have to admit, it does look weird to me too, with those strange little tails hanging out the back. it’s an acquired taste for a few of us. 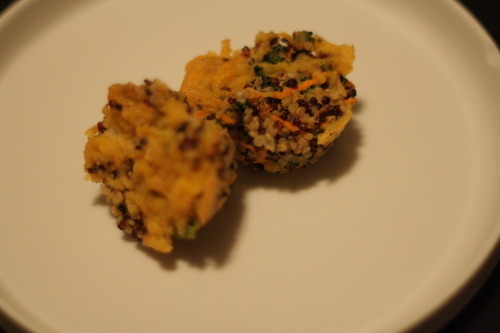 this is a much better way to eat it–make the quinoa first, then mix it with spinach and other things, and bake in mini muffin tins. i used onion instead of shallot which was no big deal. they were tasty both hot and cold, and would be very portable. ryan gobbled several before i stopped him to ask if he knew what he was eating.